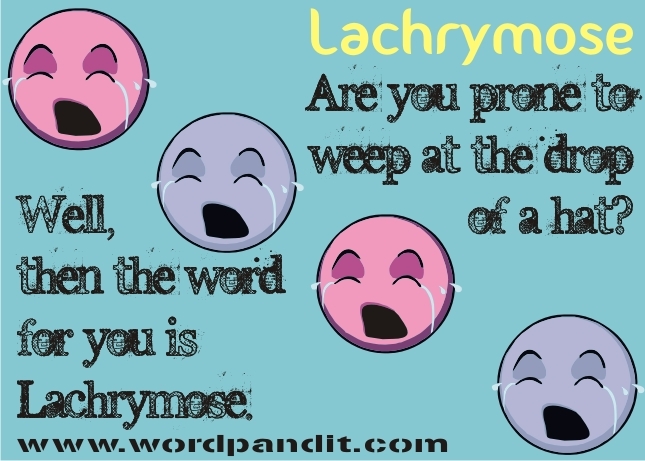 The word Lachrymose comes from the Latin root ‘lacri-, lachrymo-, lachry- + ’, meaning ‘a tear, or tears [from the eyes]; as when crying, etc’. Case a glance back to your school days. There was a child in one’s class who used to cry at the slightest possible instance. I remember a couple from my own school days. Those kids were the lachrymose kids. 1. The death of close one can turn the most rigid person into a lachrymose one. 2. Rosa’s human figures never smile; instead they seem grim, wary, defiant, sullen or lachrymose. — The Wall Street Journal, “Return to the Grim and Dark”.